Most café aficionados will have you know that a large reason why they are drawn to cafés is because of the ambiance. There is something about the soothing music played in a café, the smell of freshly brewed coffee that lingers in the air, and the sight of glistening cakes in a display overflowing with baked goods that all contribute to one’s café experience. All of which, is missing from I AM. And yet, after two and a half hours, I walked away from I AM thinking that this may just be one of my new favourite cafés. 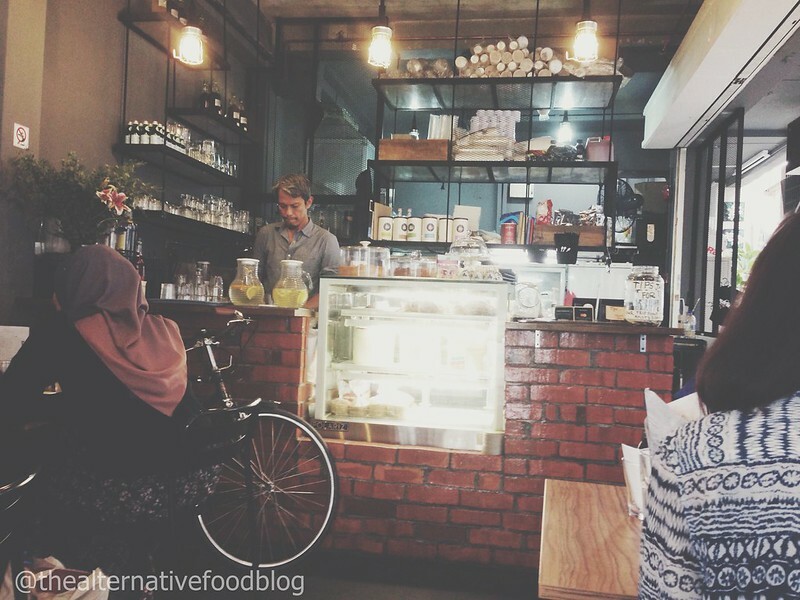 Nestled in the Arab quarter of Singapore, I AM is a Muslim-owned café helmed by three brothers. 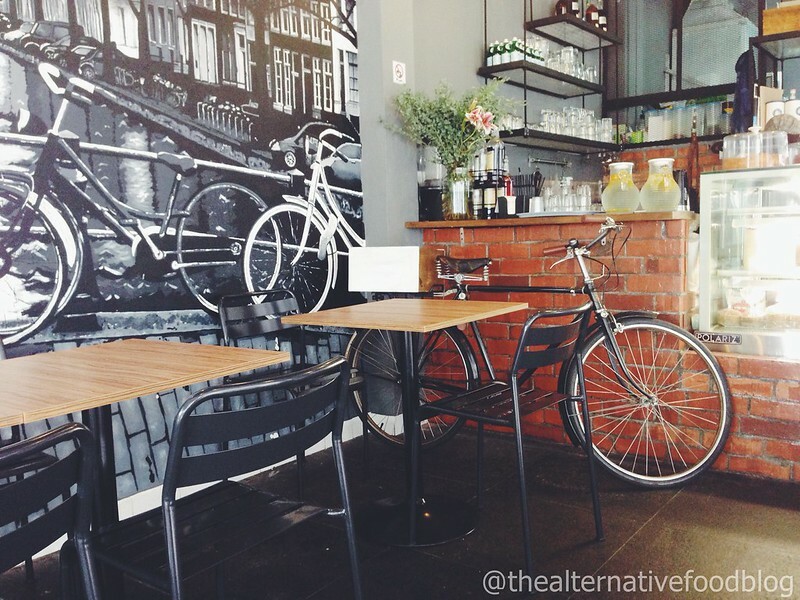 They are located just before the entrance of Haji Lane and it is impossible to miss this cafe, especially with the large black-and-white mural of one of the many bridges and canals in bicycle-friendly Amsterdam. 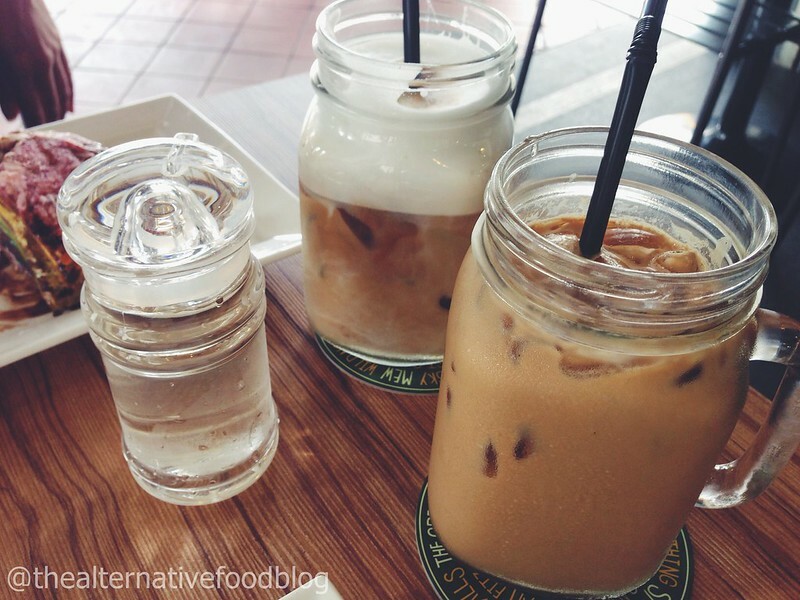 Conveniently located along North Bridge Road and just opposite the Golden Landmark Shopping Complex, the café is just a short 10 minute walk from Bugis MRT Station. When I arrived, I was surprised to see that even on a weekday afternoon, the café, which can seat approximately 18 people indoors and another 18 outdoors, was filled with young adults enjoying a late lunch. One look at this Amsterdam-themed café, and you can immediately tell that I AM is not your typical café. For one, it is not dark and romantic in the same way that is characteristic of most other cafés. Neither does it have jazz music playing or the smell of strong coffee wafting through the air. What it does have, however, is fresh air and natural light that fills the café as a result of it being an open air eating establishment, an ‘open kitchen’, which is a trend that seems to have been made its way from big cities like New York, enough room to move around, a quiet atmosphere to have easy-to-hear conversations, good coffee, and excellent service. Although I AM does categorise itself as a café, I am inclined to list it as a bistro or casual dining establishment for various reasons such as the ambience and the dishes that they serve such as Fish ‘N’ Chips, pasta and virgin Mojitos. According to their Facebook page, their menu is slated to be updated soon with Sunday brunch dishes so I am quite excited to see how that pans out. Our meal at I AM began with a starter of Calamari, Relight My Fire (SGD 6.90) and ended with an Iced Latte and Iced Cappuccino each (SGD 6.90). In between was a line-up of their Charcoal-Grilled Juicy Beef Burger (SGD 12.90), Fish ‘N’ Chips (SGD 15.90), a Rainbow mille crêpe (SGD 8.90), a slice of Red Velvet Cake (SGD 8.90), a virgin Mojito and a virgin Lychee Mojito (SGD 6.90 each). Our starter of calamari was not their most impressive dish, though I must admit, I have high expectations of calamari dishes because it is my ‘must have’ dish whenever I frequent Australia. 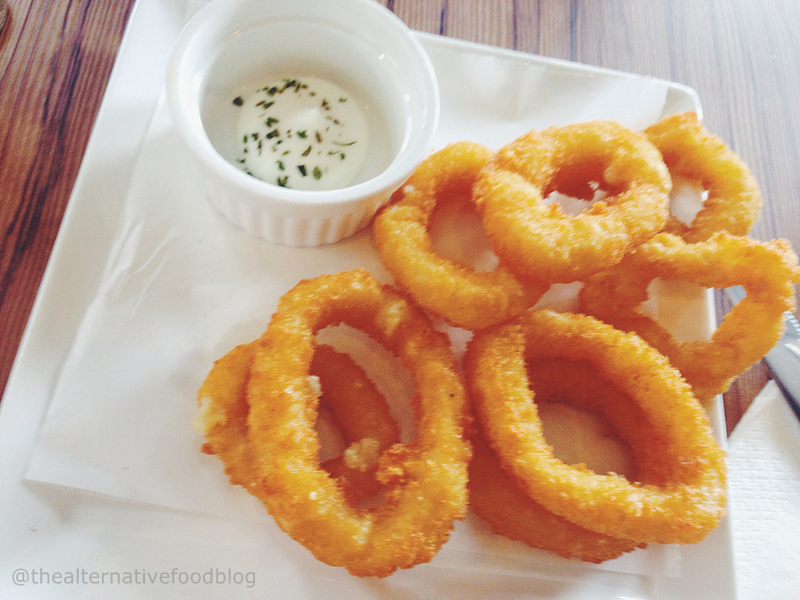 While I wasn’t a fan of the thick breaded batter, I do think that the calamari was well-prepared as it wasn’t overly chewy or rubbery, which is often a sign of overcooked calamari or squid. 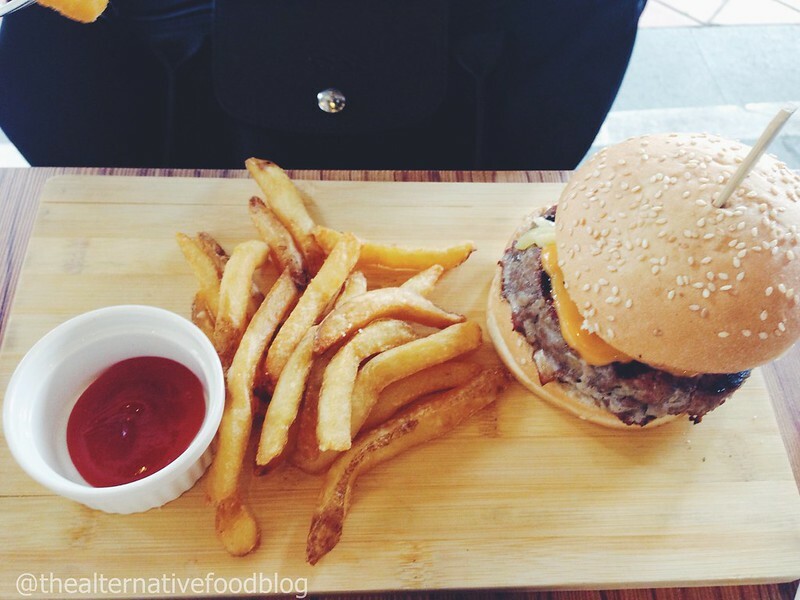 My friend ordered the Charcoal-Grilled Juicy Beef Burger which she had heard good reviews about. The burger, which consisted of two toasted buns, onions, melted cheese and a slice of pineapple, was served with a side of fries and tomato sauce. According to her, the patty was juicy and had a nice consistent texture but lacked seasoning. 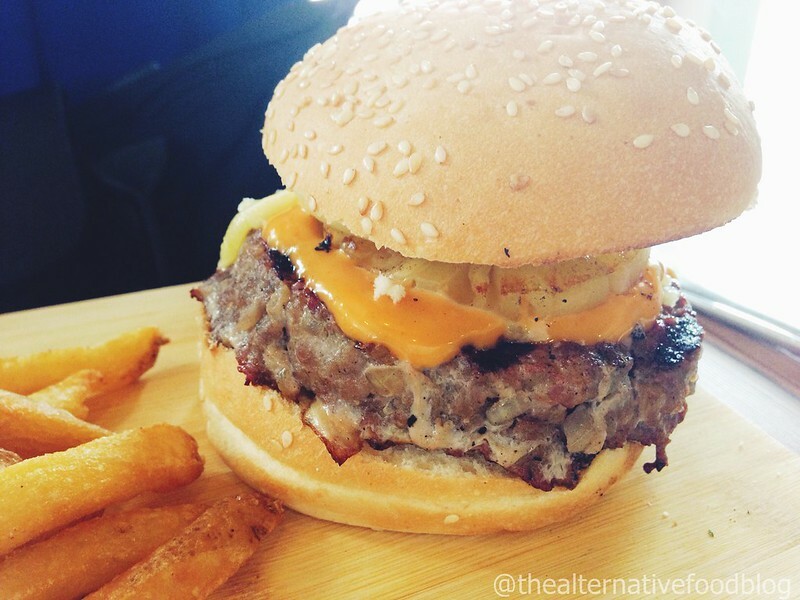 While she did taste salt in the patty, she still felt it was lacking a certain punch to it. However, she did say that the addition of the cheese and the pineapple to the dish helped to add an extra dimension and flavour to the dish. One of my favourite dishes in the world is fish and chips and just like my calamari, I have been spoiled by the offerings of Fish and Chips in Australia. 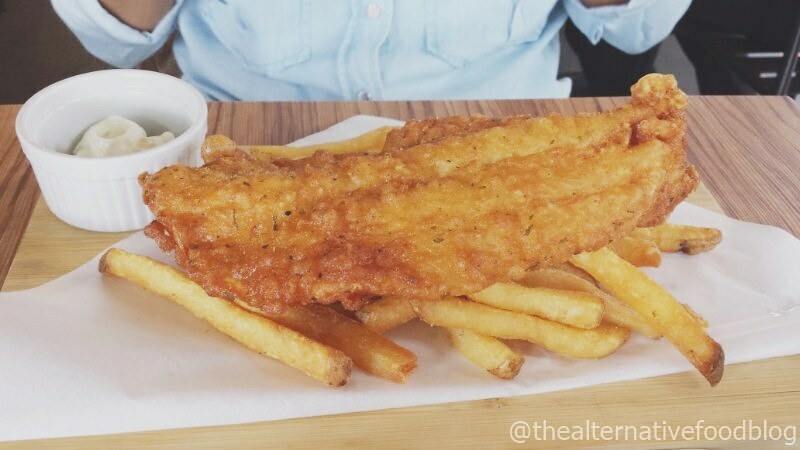 While some people like a breaded or crumbed coating on their fish, I am a fan of the English-styled batter which is light and crispy. 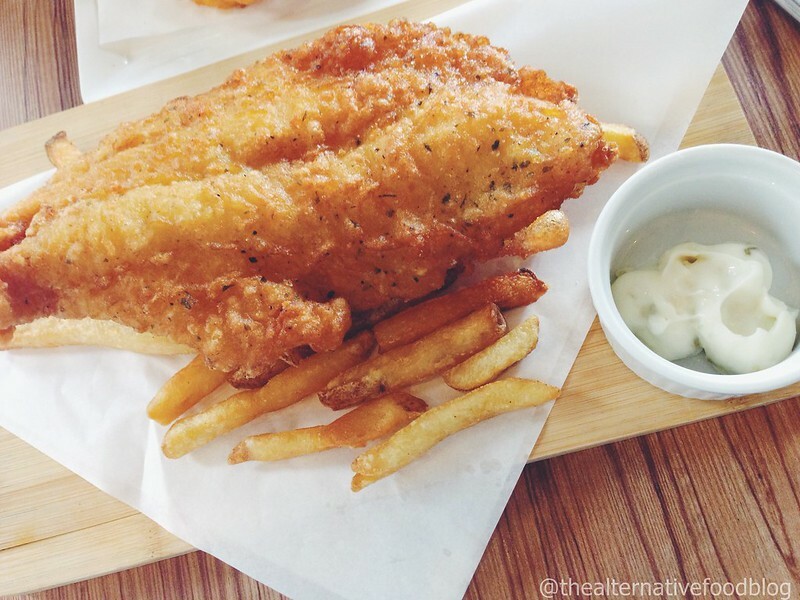 I think I can safely say that I AM serves the best fish and chips in town. The batter is light and crispy and this means that all the focus is on the fish. The problem with the English-styled batter is if the fish isn’t fresh, you will be able to taste it immediately. Thankfully, I AM didn’t disappoint at all. Their fish was fresh and so well-cooked that I could flake off pieces of fresh fish easily. Even though the batter was deep fried to a crispy and crunchy perfection, the fish was still so moist and tender on the inside. This was their pièce de résistance for me. Throughout our stay at I AM, I was thoroughly impressed with their service. While waiting for our desserts to be served, I overheard one of the staff asking a patron, who was carrying her infant, if she would prefer to have a high chair for her child. He then went out of the shop and brought back a high chair and went on to assist her with placing the high chair in a position that would be comfortable for the child and also would not not obstruct other patrons. I also overheard the same staff visiting a few tables to ask if those patrons needed anything else and if they were satisfied with what they had. Having been to quite a number of eating establishments and cafés, I don’t think I have had such an experience before, so I was quite taken with the personal touch that came with I AM. Our desserts came shortly after we were done with our mains. As our desserts were being served, I inquired about where the baked goods, like the mille crêpe, were made. To my pleasant surprise, I learned that all their baked goods are prepared in-house by the good people of I AM themselves. 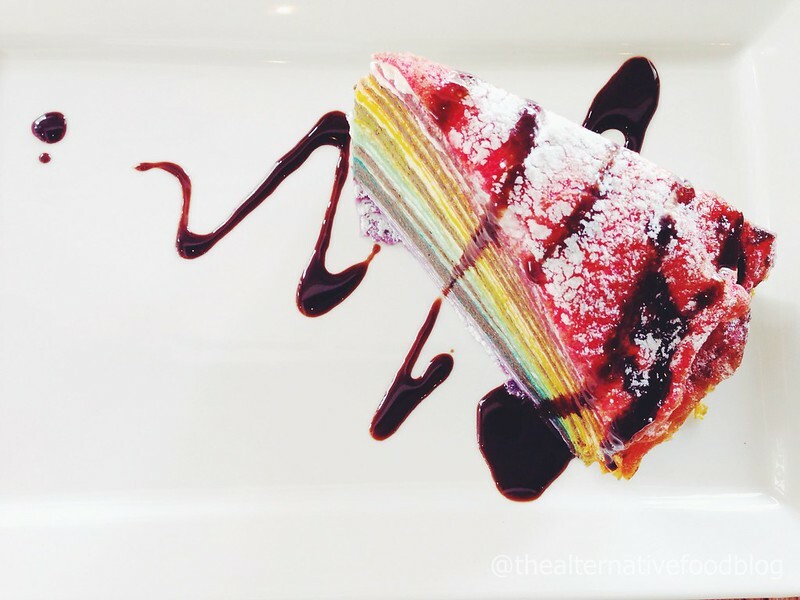 The Rainbow mille crêpe has been making its rounds on various social media platforms like Instagram so I knew it was a must-try. Similarly, the Red Velvet Cake is now one of those cakes that is so popular that you can find it in any decent establishment so it was another item on my list of things to try. If you recall my previous entry on Lady M Confections, I was quite disappointed to learn that their mille crêpe contained alcohol so I was very excited to try I AM’s version, which is alcohol-free. 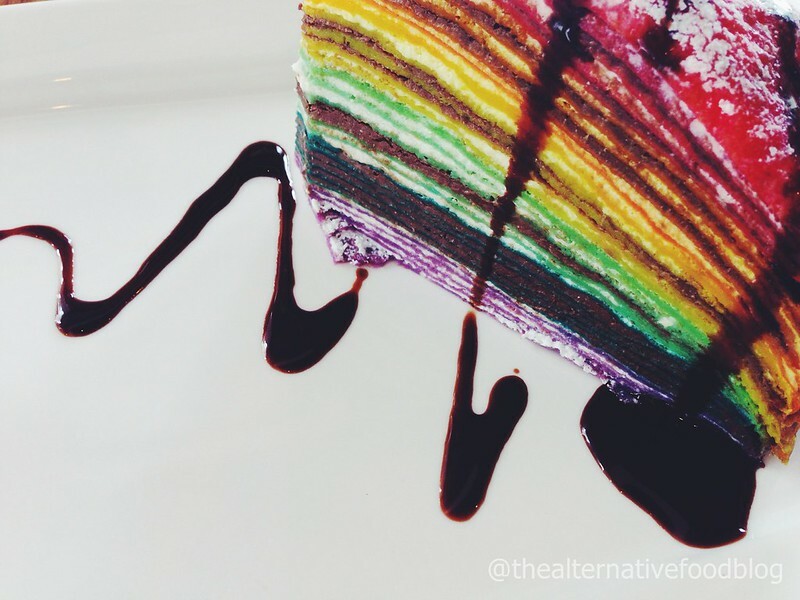 The Rainbow mille crêpe was, for the amount of crêpes that are stuck together, unbelievably light, even with all that crème slathered in between every layer. I liked the how the paper-thin layers separated itself in my mouth as I ate it and how it wasn’t too sweet. In fact the combination of the crepes and chocolate sauce worked so well together, making the dessert something even those without a sweet tooth would enjoy. 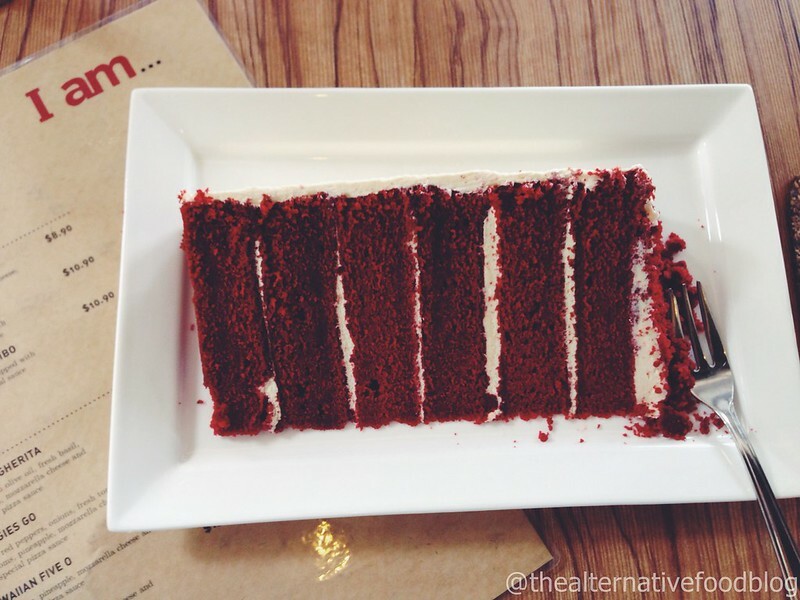 Similarly, the Red Velvet Cake was definitely one of the better versions of this cake that I’ve tasted. The cake is fluffy, even though it’s been chilled, and the cream cheese frosting is the right mix of cream cheese to icing. If you’ve read my other reviews, you will know that I prefer cakes that are fluffy and light, so this cake was definitely one that completed and complemented my meal, though I do feel that the six layers on the cake are way too much for one person to handle. Perhaps, this dessert is best shared. My only wish was that there were more desserts on offer and I hope that there will be, in due course. 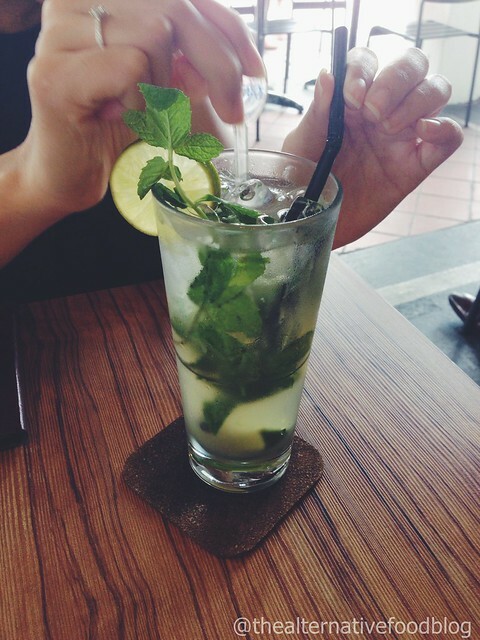 To wash down our meals, we each ordered a virgin Mojito, one with lychee and the other without. The virgin Mojitos were light and full of flavour. 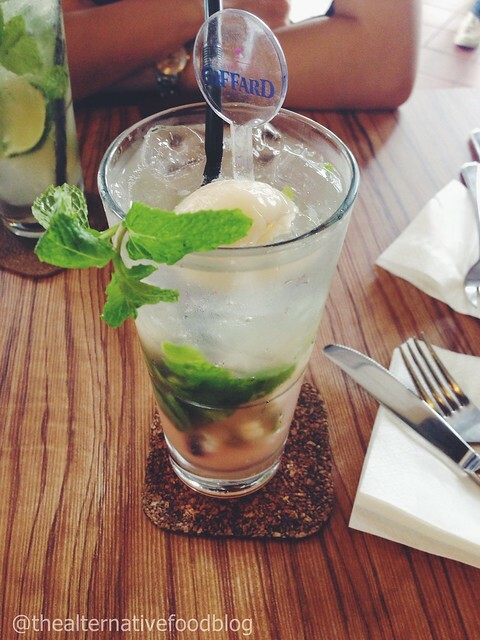 While the original was minty and zingy, mine was slightly sweeter with lychee syrup and the fruit in my drink. The combination of mint and lychee was a hit with me judging by how quickly I finished my drink. Finally, as with every café I visit, the day ended with coffee in the form of my usual latte and a cappuccino for my friend, but both in the iced variation because the heat wasn’t letting up. I usually don’t take my coffee with sugar or sugar syrup, but I had to with the latte at I AM possibly because the cake was already sweet and that in turn made my coffee bitter. Having said that, the blend and strength of the coffee was definitely one I would come back for. Every time I visit a café, I always hope to leave feeling recharged and slightly more optimistic about the days to come, and my visit to I AM was no different. I was so excited when I heard about this new Muslim-owned café and I am pleased to say that this is definitely a place I’ll be back to for many more times to come. 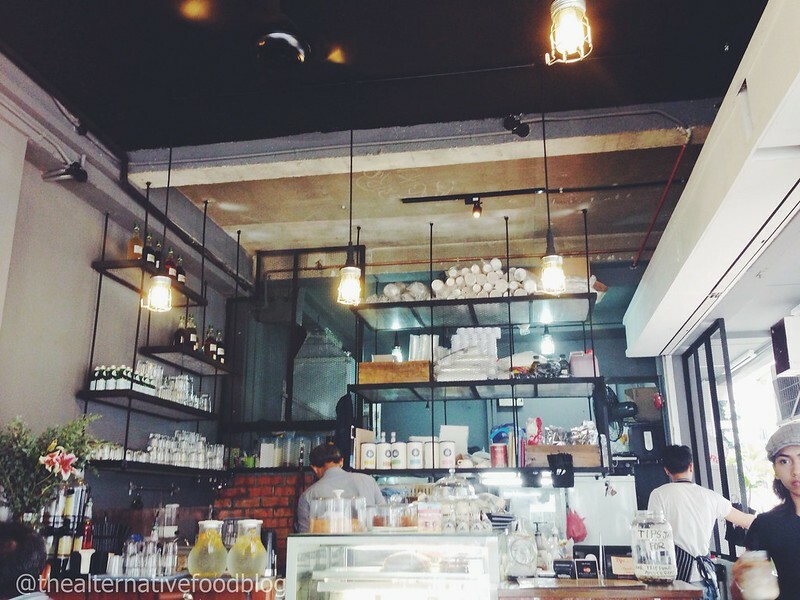 There are so many plus points for this café – location, desserts, coffee, food and ambiance just to name a few. I am already planning to bring different groups of people back here again. However, the vegetarian options are limited, with only pasta and pizza for mains and vegetarian sides of onion rings, fries and wedges so this may be something to consider. I AM is slowly redefining the café scene in Singapore with its open-air and Amsterdam-inspired concept and it is quickly filling the much-needed void of halal cafés and bistros in Singapore. I know where I am going to be this weekend. Do you? Our verdict? ♡ ♡ ♡ and a half / ♡ ♡ ♡ ♡ ♡ (3.5 out of 5 hearts). We’ll be back for more!